I have relatively ambitious Christmas Knitting plans this year; so far all plans are for family. So, while I have, and will be doing lots of knitting in the coming weeks, I won't necessarily have a lot to show until after the gifts are given. I am not exactly sure which of my family reads this blog - I don't think many of them do, but you never know. I have cast on, and been working on the first round of knitted gifts. So I am offering a sneak peak of the projects that are part of the first round. Some have been featured here before, others have not. 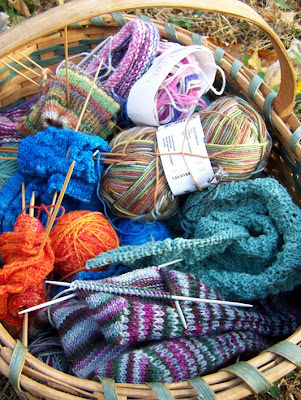 This rather colorful pile of yarn represents four pairs of socks, one hat, and one scarf. Will there be a round two? Only time will tell. Though - it will be likely if I quit making stupid mistakes in my knitting and don't have to redo my work.